In the past several weeks official Yerevan has been mum about the recent events in Ukraine, including both the formation of a new government after the ouster of elected president Viktor Yanukovych and the referendum held in the breakaway pro-Russian republic of Crimea to join Russia. Despite the fact that Russia is Armenia’s top strategic and military ally and soon will also become the top economic partner when Yerevan finalizes its membership in the Moscow-led Customs Union later this year, the Armenian government preferred to wait and see how developments in the neighboring region unfold, limiting itself to only calls for a peaceful resolution of the situation. Meanwhile, Crimea’s de facto secession from Ukraine will certainly become a factor that Armenia will have to reckon with in its future foreign policies both in the context of relations with Russia and the West as well as in the context of the Nagorno-Karabakh conflict at the heart of which there is also the problem of ‘territorial integrity v self-determination’. 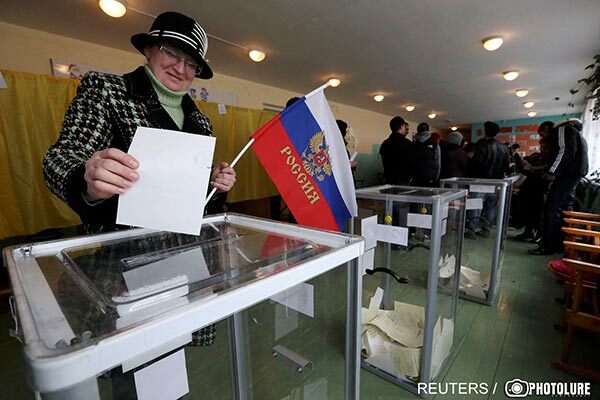 More than 95 percent of the people who came to polling stations in Crimea on Sunday voted for the region’s becoming part of the Russian Federation. Official Kiev has not recognized the legitimacy of the vote, neither have the United States or the European Union. The West has threatened to introduce sanctions against Russia if Moscow “annexes” Crimea. Talking to Russian President Vladimir Putin on the phone, U.S. President Barack Obama emphasized that Moscow’s actions in Crimea violated Ukraine’s sovereignty. At the same time, he said that there was still a possibility for a diplomatic solution, which, however, required an end to what in Washington they see as a Russian armed incursion into Crimea. Moscow, however, insists that the Crimean referendum has been in keeping with international law and fully reflects the desire of the local population to see them as part of Russia. The Union of Armenians of Russia also voiced its support for “the expression of will” by the Crimean people (a majority of Crimea’s population 2 million-strong population are Russians, with ethnic minorities including Ukrainians and Tatars; ethnic Armenians make half percent of the Crimean population). Analysts in Russia and abroad currently try to estimate how damaging Western sanctions will prove for Russia and eventually its political and economic allies. There is already speculation about possible sanctions against key figures of the Russian state economy. Heads of the largest Russian companies, Rosneft and Gazprom, Igor Sechin and Alexei Miller, thus face visa-related and financial sanctions, writes the Russian daily “Kommersant”. The U.S. has also hinted at the possibility of opening up its oil reserves, which can significantly reduce the price of oil and natural gas and eventually Russia’s standing on the international market. A week ago Washington released the first 5 million barrels of oil, which immediately affected Russian stock indexes and the exchange rate of the Russian ruble. Still, judging by media publications, many in the West are less reluctant to accept what they view as annexation of Crimea, and the matter today concerns only the eastern regions of Ukraine where Russia may also provoke separatist sentiments. The international community is also concerned about an actual clash between the Russian and Ukrainian military and about how the division of Ukraine will affect other nations. Armenia and Nagorno-Karabakh have so far refrained from making any assessment of the situation in Ukraine, including in Crimea. Although officially Armenian authorities have not expressed their support for the post-Yanukovych government in Ukraine, they did not expressly state their support for the preparations for the referendum in Crimea either. At present, analysts wonder which country or part of it will be next that Russia will want to ‘save’. Some believe it may be Nagorno-Karabakh.